If you want your work to be read, you need a strong headline, title, or subject line for the text you’re writing. Readers expect a title to give them a short description of the contents in a way that piques their interest in the topic. When a title doesn’t, it’s possible that you won’t people won’t read any further. They’ll just skip on to something that is interesting. It’s important, then, to teach students how to write strong headlines, titles, and subject lines—and I have a great technique you can use, based on an observation Guy Kawasaki shared on Google+. Kawasaki posted a screenshot from his blog indexing site, Alltop.com, and observed, “You can see who the good headline creators are when you see them side by side.” Indeed, you can. Try the technique yourself by clicking on the screenshot above. 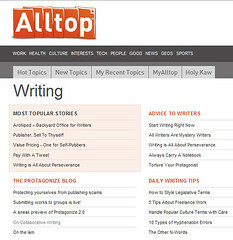 It shows headlines from four blogs on the Writing page on Alltop. Even with the limited number of titles in the screenshot, you can see that some headlines are better at catching your attention than others. I want to go read The Other N-Words, for instance. The blogs at the top of an Alltop page tend to be stronger, so there’s not an obvious dud in the image. If you visit the Writing page on Alltop though, you’re likely to find some headlines that don’t work. On the current page, for example, I’m uninterested in Exercise 9, 10, 11, or 12 from Aldys Fiction. Aldys Fiction may be a great site, but based on those headlines alone, there’s nothing to convince me to go read anything. Choose a page on Alltop that focuses on a topic that students are familiar with. Alltop has pages for hundreds of topics, ranging from American Idol to Zombies, and from Anthropology to Zoology. Nearly any topic students are exploring can be found on Alltop. (That makes the site great for research too, but I’ll save that for a later post.) Be sure to review the page you choose to ensure the blog titles are all appropriate for the classroom. Print the Alltop page. You can work on the live website, but when you mouse over a blog title, more information from the post will pop up. Since you want students to focus on the titles alone, the live site isn’t the best option. Further, Alltop is updated hourly, so an inappropriate blog title may appear. Printing the pages avoids both of these problems. If you want a paper-free option, print to PDFs and work from the files rather than the live site. Pass out the Alltop page, and ask students to mark 10–15 blog posts that they want to read. Encourage students to move quickly through the options. The point is to make fast decisions. Give them two or three minutes. Next ask students to identify 5 blog posts that they would not read. Again, ask them to work quickly, as if they were scrolling down the list on a computer screen. In small groups, have students share their selections and note posts chosen by more than one person. Have them create a group list of approximately 15 blogs the group would read. Ask group members to compare the 15 blog titles and identify what makes the titles compelling. Encourage students to look for similarities. You might work through an example title to demonstrate features that typically make a headline stand out. Have students use the similarities to create guidelines for strong titles. Students can consider the 5 posts they each said they would not read to see how they violate their guidelines as well. Compile all the group guidelines into a class list. Groups can share their lists with the class. As a group shares its guidelines, note new ideas on the board. Work to group related ideas as the groups present their lists. Once all groups have shared, review the class list together and make any revisions. Talk about how to apply the headline guidelines to paper titles and subject lines. Add suggestions on how to adjust the information for different rhetorical situations. For homework, ask students to strengthen the titles on their texts by using the guidelines that the class has created. If desired, students can submit a before and after version of their titles that you review during the next class session. As you go through the activity, you may find the opportunity to review the rules for using capital letters in titles. You can point to the guidelines in your class text. For a thorough review, point students to the details on Capitalizing Titles from Grammar Girl. For a bit of fun, you can try out the SongCase – the song title capitalizer. So there you have it. It’s fairly simple, but it should influence the headlines, titles, and subject lines that you see after the class completes it. Do you have any tricks for teaching students about headlines, titles, and subject lines? Leave me a comment! There are right ways to dress for a job interview. Sure, you want to stand out to an extent. You don’t want to blend into the sea of suits that march before the hiring committee. But, um, you don’t want to stand out for the wrong reasons. Probably shouldn’t wear a catwoman costume to an interview for at an engineering firm. The same advice applies to résumés. 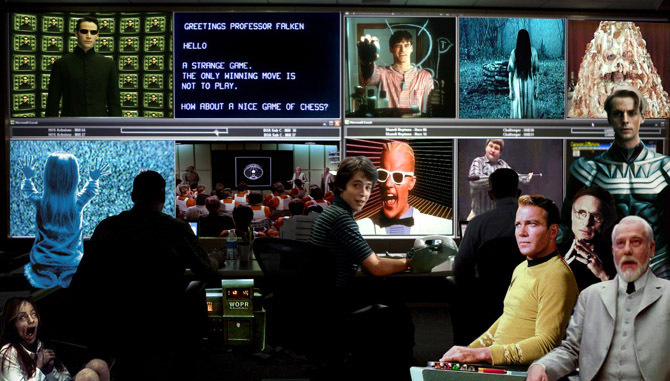 When I talk about résumés with students, I do encourage them to do things that will make themselves stand out a little. Traditional résumés can get very boring when you’re reading through a stack of 20 or 30 of them. If students can make themselves stand out, they have a better chance of being noticed—and we all know that being noticed can lead to getting that job. It’s just as important, though, to talk about how audience comes into play in preparing résumés. You can teach this lesson quickly and clearly with the Dzine blog collection of “27 Examples of Impressive Resume(CV) Designs,” which my friend @Alliegator8u found and shared. Go over résumés as you normally would, exploring more traditional examples in your text or online. Share the DZine collection of résumés with students and encourage general feedback and discussion. You can click on the résumés to see larger versions. Once general discussion dies down, ask students to think about the jobs that they would apply for themselves. You might group students with like career goals for this project. Have students brainstorm some details about the positions and companies they will send resumes to. Emphasize that students are effectively completing an audience analysis for these companies. Return to the DZine collection of résumés. With their audience analysis in mind, ask students to identify which of the résumés might stand out and still fit with the needs and expectations of the audience companies. Encourage students to read through the comments on the page for some interesting discussion as well. It’s likely that some of the more intriguing DZine résumés will be inappropriate. While they are clever and eye-catching, most of the résumés are suited only for edgier graphic design positions and companies. I don’t think I’d encourage MrSunnyBlack or Sofiane42 to send those résumés to a conservative company. But Kenji2030 and Kamilmytnik might have a reasonable mix of traditional elements and “wow” design that would let their résumés stand out without ending up in the decline pile. As the résumés should make clear to students, it’s all a matter of the audience the résumés are presented to. You’ve made an impression alright, but it may not be the one you wanted.